Restore hair to its former glory, ready to style anew! 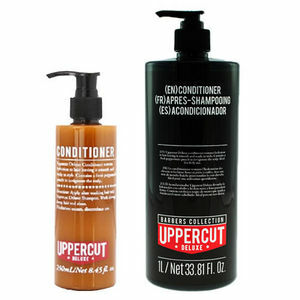 Uppercut Deluxe Conditioner is the perfect partner for Uppercut's own Shampoo—using both together creates the perfect canvas for you to create the next wild style. Your clients will be amazed at just how much easier it is to work their hair into their chosen style after using this conditioner. The conditioner contains a refreshing peppermint punch which leaves scalps feeling fresh and invigorated. Continued use also restores the hair's body and leave it more manageable. Specially-formulated degreasing shampoo for wet or dry hair that's simply awesome at washing out grime and product build-up.